Thursday the seventh of July was a good day. It started by bumping into the Prof who supervises the PhD student I was said to have raised money for. He recognised me and we had a good chat and he asked me how I was. This was in complete contrast to the beggar I walked past the day before who asked me for 50p. I politely declined. He then said “one day you’ll need help mate” I thought and should have said it “you have no idea mate”. Mum had successfully nominated me for a British Citizen Award, which I said I won in the awards blog. This was no mean process and it’s a very special award to win. The British Citizen Awards is a ceremony held bi-annually and recognises people doing extraordinary works in the local community. The awards take place in January and July each year, with the inaugural ceremony having been held in January 2015. The presentation ceremonies take place at the Palace of Westminster hosted by The Lord Dholakia. The only people that cannot be nominated are those with Queen’s honours e.g a Knighthood. There were over three hundred nominations. Mum actually nominated me late, but they considered her application anyway. It’s judged in a very professional and extensive way to ensure that the award continues to be meaningful. Some candidates are even asked for an interview. However due to the publicity of my story, the blog and paucity of time, that was thought to be evidence enough. The fact they considered me after the deadline made it seem likely that I’d be accepted. The day started at three pm, going through security at the Palace of Westminster. All 35 BCA winners, myself included, along with their guests and various VIPs were all clutching their invitations from Lord Dholakia. The invitation came with parliament’s official seal on it. I got talking to a gentleman in the queue who’d been the treasurer for his local PHAB (physically handicapped abled bodied) club for thirty years. 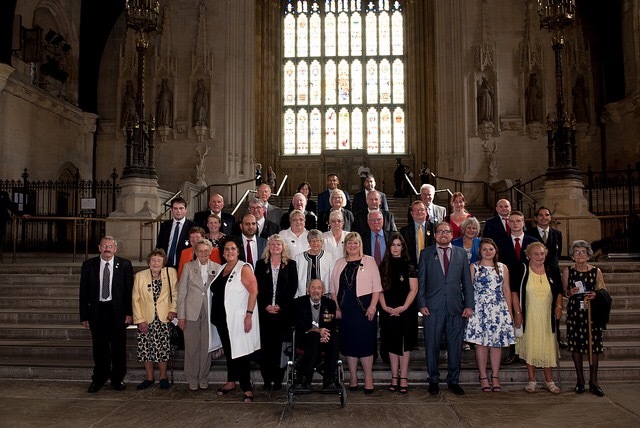 We were then led to the Lords meeting room for afternoon tea and the medal award ceremony. Fiona Phillips of ITV breakfast television fame was the celebrity host. I wasn’t particularly familiar with her to be honest but she was really good and brought a sincere yet humorous manner to the occasion. Our table was laden with cakes, sandwiches, scones and some very good quality strawberries. We were invited to tuck in due to the length of the talks and yours truly, started straight away. I did what seemed like most award winners were doing, I found myself in the pamphlet before reading anyone else’s entries. I was near the end of the book so I took the opportunity to take my jacket off. It was frighteningly hot in there. Each person went up one by one with Fiona giving a little spiel about each. Eventually getting to me, the penultimate medal winner, I was handed a silver medal by the founder of specsavers and went off with pride. The medal is surprisingly heavy; the weight gives it a certain prestige. Later after countless group photos, we met up with all our other guests for the rest of the day’s proceedings. I’d been cheeky and had the most guests, after enquiring for more. We clamoured onto a tour bus for a BCA commissioned open bus tour and a mid twenties chap gave a pretty good tour. There was a large sign on the side explaining who we were, for a second or two I pretended I was Jamie Vardy. The two big facts of the day was the explanation of why Lambeth Bridge is painted red as it is closest to the House of Lords which has red leather benches and this is in contrast with Westminster Bridge which is mostly green like the House of Commons benches. Then the tour went up Horseferry Road, named after the horses which used to pull a raft across the Thames before there was a suitable bridge. The tour ended at Church House which was very near Westminster (only we’d taken a long route to get there in order to enjoy the lap of honour). After sampling a few canapés, wine, or orange juice we all sat in lines ready to peel off and go to the front. The show started with a talk from Lonnie Mayne the head of Inmoment, who did a very inspirational speech. He came on stage with an impeccable suit but wearing red converse trainers. I have to admit I thought who’s this charlatan (I actually used a less archaic word) wearing red trainers. The colour of the trainers was due to his father’s wrestling shoes. Max Morris, BCAv who collected lost golf balls from his local club and sorted them out, boxed them up and gave them to various charity shops. He did this for 18 years only just retiring at 105, he’s raised over £100,000 in this time. Barbara Craig, BCAh who set up ‘Nosh and Natter’ which enables local people to come and socialise and now gets 80 people together every month, countering loneliness and isolation in the community. Stanley Taylor, BCAc a former world number 6 at middle distance running. Now at 78 he still spends time coaching young athletes four times a week which he has been doing ever since his career ended. Torren-Lee Dewar, BCAa set up a dance company called Alliance Dance Unit, to give young people something positive to aim at and work towards. The amazing thing is he did this at 16, and in the six years since then hundreds of teenagers have passed through his dance company. The presentation of the certificates involved each of the award winners going up and saying a few words. Unfortunately they were doing the certificate presentations in reverse order to the medal ceremony earlier in the day. I was thinking I had a long time to prepare my half a minute speech. I was now second up which caused me a bit of panic. Mum tried to record it, but somehow recording didn’t work so I’ll summarise what I said. (Mum has asked BCA for a copy of their video). I dedicated the award to all the patients who stood up and went into trials before me, thanked my family, friends and Georgie, told everyone the Marsden was great and explained how little I didn’t desire the recognition but it was nice. Then I went to leave the stage without my certificate for Fiona Phillips to remark that I didn’t want the recognition so much that I forgot it! Fiona was a good host. At times some of the medalists spoke for too long and Fiona was not so subtly instructed to speed them up but she flatly ignored them and gave everyone their big moment. Overall it was a fascinating event and it gave us all a collective motivation to keep going. The press, the media and society should do more to reward the unsung heroes that we have. These people’s actions go beyond those people they’ve helped or the organisations they’ve raised money for, and stand as testament to what each person can do if they are willing to give the best of themselves. In my case if we all did more, cancer would be beaten sooner.